Guests at this weekend's Bath Artisans Christmas Show and Sale will have the chance to win one of these two paintings. Photo by Adam Prudhomme. A holiday tradition returns to the village this weekend as the Bath Artisans will host their 2018 Christmas Show and Sale, Nov. 10 and 11 at St. John’s Hall. Running from 10 a.m. to 4 p.m. on both Saturday and Sunday, the event offers an opportunity for early shoppers to get a head start on their gift getting. Those in attendance will also have the chance to enter a free draw, where they’ll have their choice of selecting one of two original pictures, painted by the club’s members. The other painting not selected will be donated to a local gala. The paintings, which depict a nature landscape and a bouquet of flowers, were completed by several members of the club, each offering their own touch to the group effort. As for the art that will be on sale, there will be a wide range of subjects on display. The creations will range from small to large as well. Artists will be on hand to answer any questions and explain the detail that went into their creation. This will mark the 26th year for the Bath Artisans Christmas Show and Sale, which is quite the accomplishment given its humble beginnings. 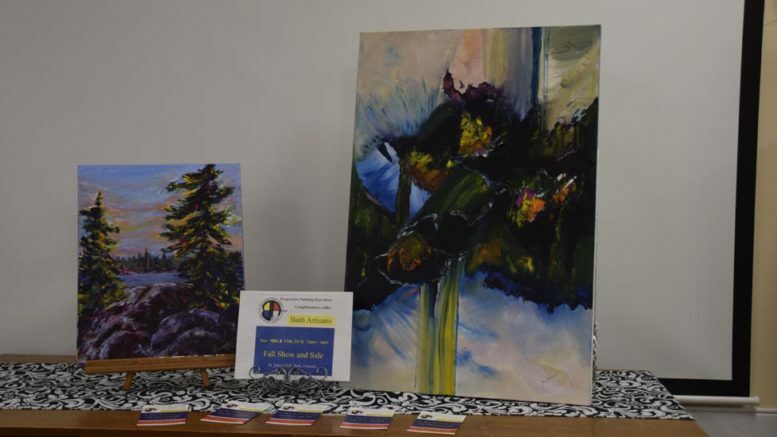 Examples of their work can be found year round in St. John’s Hall and the group is open to artists of any talent level. They meet every Monday to work on their art. St. John’s Hall is located at 212 Church Street in Bath.